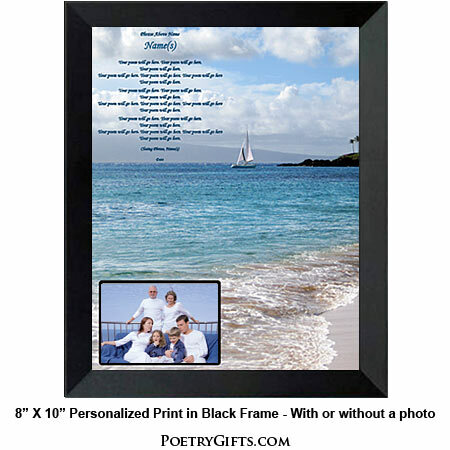 Your Words + Our Personalized Design = A Unique Poetry Gift! Here's a chance for you to write a poem or verse for a friend or family member who is celebrating a special occasion. 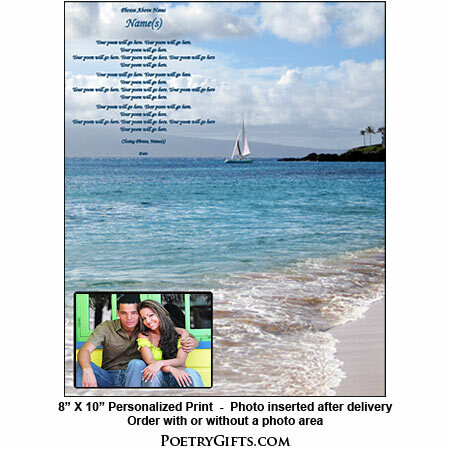 What about giving a personalized poem as a birthday or anniversary gift. 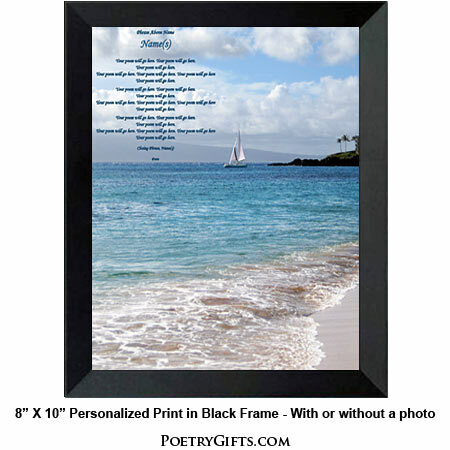 Your poem in this lovely ocean scene will mean the world to a loved one. Don't know what to give for a special occasion to a special person? Don't want to spend time walking the malls trying to come up with ideas? Here's an idea...why not put your thoughts and feelings about someone special to you down on paper. We would be happy to take your words and put them into this beautiful ocean design. The poem can be personalized with names and a closing message from you. You can also choose to attach a favorite photo to the design. 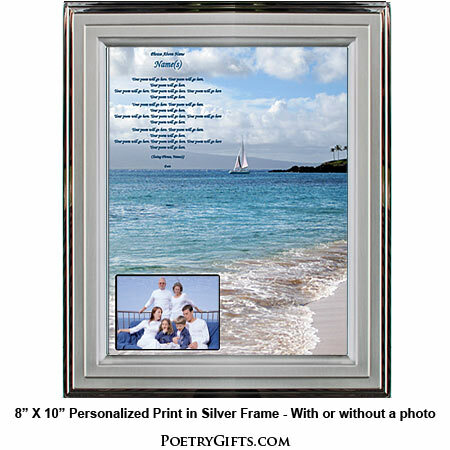 Think how special your husband or wife, parents, grandparents, children or friends will feel when you present them with a poem that you wrote specifically for them. Your Poetry Gift will be a Meaningful, Thoughtful, and Lasting Keepsake. 3. Closing Phrase and Your Name(s) (as seen after poem) - (Examples: All My Love, Shannon; Love You Always & Forever, Steven; All Our Love, Mom & Dad; With Deepest Sympathy, The Oliva Family; etc.)" Please look at the above design in order to determine a suitable poem length. We suggest your poem is no longer than 24 lines with no more than 12 words in each line. There are no set guidelines; this is just a suggestion. If your poem is much longer than the length we are suggesting, the font/type will need to be made smaller to accommodate your entire poem. On the order form, please make sure to type your email address that you check often and phone number in case the designer needs to reach you with any questions. Unless you have permission from the author or poet, please only submit non-copyrighted works. I loved the finished product. The poem was formatted to fit nicely in the right space. I was prepared to be happy with the product but when I received it it surpassed my expectations. I will definitely use this company for any future poems that need to be framed. Excellent service and quality. I would not hesitate to use this service again and have already recommended this site to many people. I absolutely love the job they did! The poem I wrote looks so beautiful set on the paper, in the frame. It is going to make the day so much more special. The service was superb! The delivery was fast and so helpful! i love it and i would come back again thanks so much. The framed poem along with the custom phrases I requested surpassed by high expectations. Thank you very much for a great product and a job very very well done.